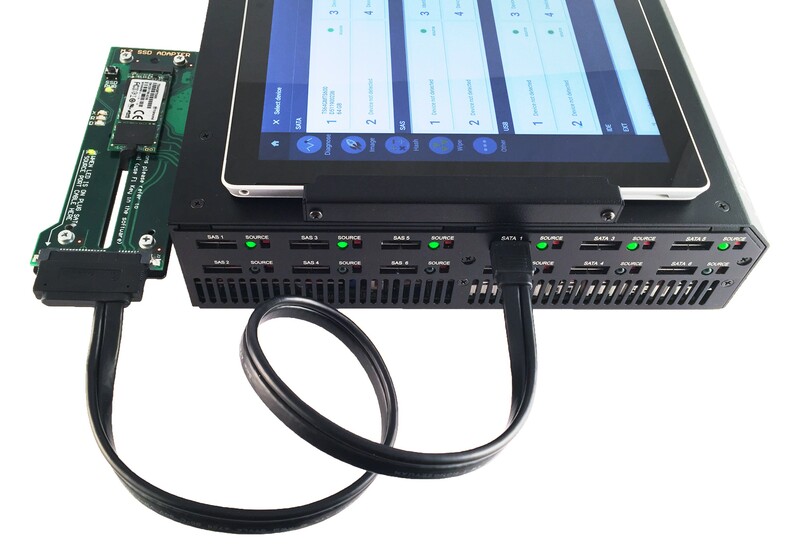 TaskForce system allows expanding its compatibility with other device interfaces via hardware extension modules. 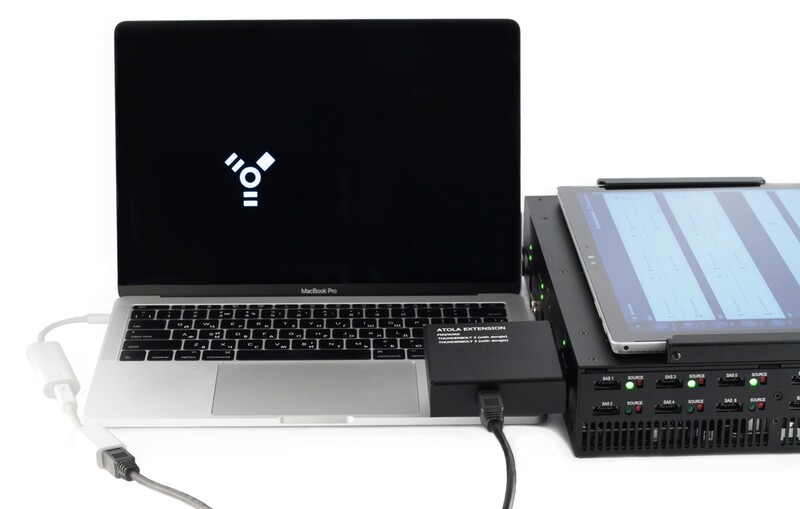 With the help of Thunderbolt extension module TaskForce supports imaging, hash calculation, write protection on MacBooks with these interfaces: FireWire, Thunderbolt 2 and Thunderbolt 3 (2016 – 2017 models). Connect MacBook to TaskForce unit with the help of Thunderbolt extension and the FireWire cable. Use adapters if needed (included). To boot MacBook in Target Disk Mode, start it up while holding down the T key until you see a Firewire or Thunderbolt icon displayed on screen signifying Target Disk Mode. Power on TaskForce and wait for the booting to be completed. 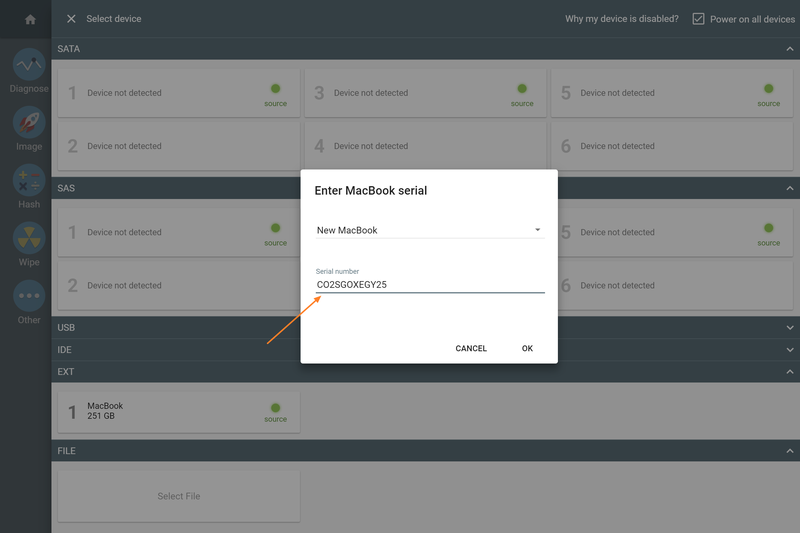 Click the port in Extension section of the Device menu. In the Enter MacBook serial pop-up window, enter the serial number located on the bottom side of the MacBook and click OK. This module supports custom proprietary PCIe SSDs from Apple MacBooks (Mid 2013 – 2015). Important: Drive hotplug is not supported yet. TaskForce must be powered off before installing or replacing drives. For M.2 SATA, drive hotplug is supported. 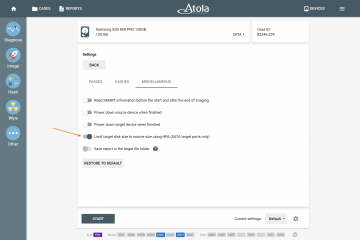 It allows installing and replacing drives by powering off the extension port in Atola TaskForce software. When the target drive is larger than the source evidence drive, the target hash will not be identical to the hash of the source. To avoid this, you can limit the drive space by enabling HPA to a SATA target. 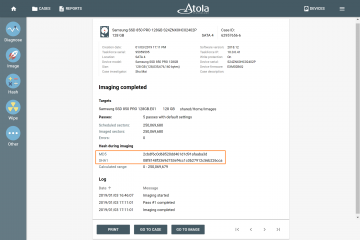 Create a new E01 file, to which you will image your evidence and select both MD5 and SHA1 hashes to be calculated in the course of imaging. SMART table is a valuable source of information about a hard drive’s health. 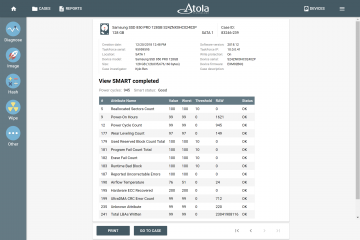 SMART (Self-Monitoring, Analysis and Reporting Technology) provides stats of a drive’s operation, thus helping predict its future failure.